I was waiting for Mr. Owen to show the cover of book III "The Indigo King" before I put this review up... but something happened to make me want put it up NOW!... It's a video interview that you can find the link to at the bottom of this post! I will post the cover to book III when it becomes available! This is probably the best review I've ever read on a book that I have read... and that's probably because it appears to have been written by the author! So, there's no way I can improve on that! As book one: Here There Be Dragons, ended we found out who our heroes are ( Charles: Charles Williams/ Jack: C.S. Lewis/ John: J R R Tolkien) book two picks up nine years later, and our heroes continue on to the next exciting adventure in true form. Mr. Owen brings Legends and Myths and Fantasy Figures galore, back to life or references from them to the point you just have to smile as you read along. If you don't have at least some memories pop up from reading this book, I will be greatly surprised! Once again I have found Mr Owen's writing to be thoroughly enjoyable, found it hard to put down, and with each chapter you are gifted with a piece of his fantastic artwork! You can't ask for much more! If I had to find something bad to say about this book I would be hard pressed indeed! The only thing "wrong" had nothing to do with Mr. Owen's writing at all..but rather the publishing of it. For whatever reason the glue holding the back cover binding came loose from the pages and now my book sets crooked! grrrrrrrrrrrrrrr.. someday I will have to replace it, but unfortunately it will have to wait. I am glad the pages didn't loosen or fall out and that I was able to read it all. I truly enjoyed these books! I know Mr Owen is writing as fast as he can to complete book 3, The Indigo King. I was just at Mr Owen's site and found a wonderful video of an interview of him!!!! He really explains the books so well you really have to see it!! So PLEASE, go to his site, scroll down and on the right hand side under CONNECTIONS, click "James A Owen's Sketchbook and Journal" and it will take you to part one of the interview, with a link to part 2! Hearing about his books from his own lips is worth a lot more than I can say here on my blog.. so please go and see this wonderful interview! Gandalf the Gray would most likely head the list. (.. and no it wouldn't hurt if he looked like Ian McKellan and sounded like him either!) A man of great power, but doesn't flaunt it or use it unnecessarily ..only when there is no other way. I'd like to find out what he's like when he's relaxed and contented. I feel he'd be full of wisdom, of the common sense kind, and that would make him a most wanted guest. To add fun to the party I think I'd invite Tasslehoff Burrfoot. A character (kender) from Dragonlance. Mischievous and always getting into something that would keep the party lively. Many times he's made me laugh, and I need laughter in my life. Wouldn't it be wonderful if the characters we love so much were alive?! Sometimes they seem so real it's hard to remember that they aren't. I think I would choose German so that I could read the Inkheart series in it's original writing. "A" book? duh.. not about to happen! 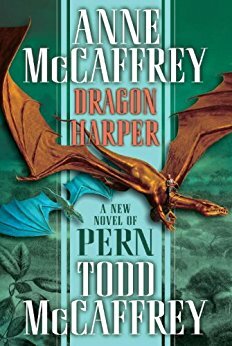 But I would take Anne McCaffrey's Pern series! Mostly I have found a whole new group of YA authors that I really enjoy! Cornelia Funke, James A Owen, Angie Sage, & Brandon Mull just to name a few. And I did enjoy a few books by A. Lee Martinez totally out of my zone about zombies, a vampire and a werewolf! I didn't think anyone could write about them and make me enjoy them but he did. A Library? For Me? wow, now that's one I've never considered before. Well for one thing it would have to be a good sized room, for it to hold all the books I'd want and to have a comfy area to sit and read. Lots of wood. Wood shelves, wood floor, nice wood tables. Actually the word "nice" may be deceiving. What is "nice" to me means "rough and rugged looking" "well used and thick". All the book shelves must have glass framed doors that open and slide above the books. (I'm old! No more dusting!) The shelves, naturally would go ceiling to floor. I might need a more modern "lift" to the upper shelves since ladders aren't for the elderly, and everyone should have access to the top as well as the bottom shelves. The reading section should have overstuffed, comfy, recliner chairs, each having it's own table and lamp. I would like a section to have leather bound classics such as Oliver Twist, Scrooge and many others. The more modern books all in hardbacks, with signatures (if possible). Fantasy, would of course be the largest section, followed by many YA books. Oh, and so I don't forget.. a room off to one side housing a small movie theater, which will have every book that has been made into a movie for viewing. The theater will also be furnished with nothing but recliners to relax and enjoy. 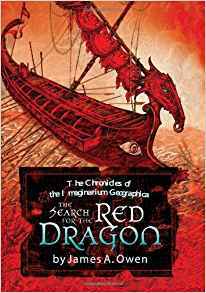 First, let me tell you that I read The Search For the Red Dragon by James A Owen before I read the following book of Dragonhaven. I put off writing my thoughts on it as I am awaiting Mr Owen's permission to also show the cover to his next book The Indigo King... so I will proceed with the last book on the list of books to be read for the Dragon Challenge..
To me, this book is a mixed bag of nuts! While the story itself was very good, and very original (which made it interesting to read), it also drove me crazy! If I were a publisher, and was sent the first chapter, which I might add is 34 pages long, I think I would have stopped reading right there! The book is written as if the teenage boy, Jake, was telling his story. (so far, not a problem) The problem comes when, as a teenage boy, he rattles on and on and on..... and on... and then... and then... refers back to what he already said! Now, I raised 2 sons, who of course were teenagers at one time, and never (NEVER) did I want to slap them across the face and yell, "Shut Up!" But that's just how I felt with Jake. Viewing dragons as fire-breathing, non-sentient animals with gigantic appetites for livestock, humans have hunted them for centuries, and now they survive only in a few wilderness havens. Jake Mendoza has grown up at one such haven, the Smokehill National Park in the American West, and has inherited his scientist parents' commitment to the park's secret inhabitants. When he rescues an orphaned baby dragon, he sets in motion a cascade of events that may eventually save these top predators from extinction. As an exhausted Jake explains, he is the first human in history to find out that a marsupial baby dragon out of its mother's pouch still expects a round-the-clock source of food, warmth, and company for over a year. Also, their telepathic communication gives Jake and his fellow Smokehill residents debilitating head-aches, and no one on either side is ever entirely sure they've got the message right. Yep, that would catch my eye alright. But I let the book set several hours before going back to it. The next chapter better be better than the first one or that's it for this book! Yes, it irritated me THAT much! The boy continued to rattle, but the magic word was spoken, "dragon". I pushed on, but skimmed here and there because if I didn't I'd smack Jake across the face! I have to say I forced myself to endure the nonstop chatter because the base of the story was really good. Very original, and that is always something you want to read. Never before had I read a story about "raising a dragon" nor the concept of dragons being marsupial! There were a lot of great things going on here... but I can't deny the wet rag was getting through the rattling on and on and on, to me it was taken to extreme and affected how I felt about the whole book. If Robin McKinley based Jake on a certain someone, I truly feel sorry for the parent! There really is a good story here, but you need to know ahead of time that you may have to fight your way through the book. In the end, I'm glad I read it... though I don't know if it will be on my re-read list anytime soon! I came across some old photos I had taken sometime over the course of the last 10 yrs. (or more!) I started looking at them and began to "feel my age".. sheesh. 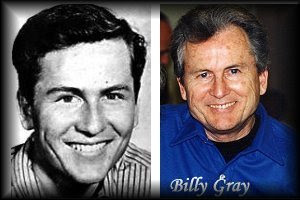 The pictures are of tv actors that I had taken at shows over the years. 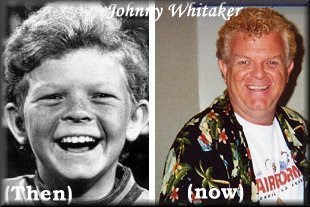 Ok, how about Johnny Whitaker? Johnny played "Jody" on the show Family Affair. Brian Kieth was the father and Sebastian Cabot (Mr French)took care of the kids. I saved the best for last .. why you ask? well because I hadda crush on David Stollery when iI was young! (was I ever young? hmmm. that's a thought that taxes my brain!) Anyway.. here are the pictures..
Wow, now this was a real fun time! 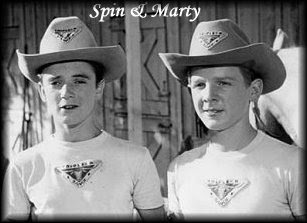 Spin and Marty! A "mini series" on the Mickey Mouse Club! Boy, did I want to go to the Triple R Ranch? Only about as much as a fish wants water! haha. I have to admit here, as I sit and ponder the situation when I met Tim Considine and David Stollery in person at the show. I gotta laugh even now.. I know I had a grin on my face so wide and hard that my cheeks hurt! lol.. gosh.. there he is! in person! and he's a real redhead! hahahaha. I did get to talk to them both and had to gush out how much in love I was with "Marty", who grinned back in return and did a "nah-nah, nah-nah, nah-nah" back at Tim and then stood up and gave me a hug! It was one of those moments that you know you will never forget! Well, this post sure ages me! I wish i could say I only remember these people from re-runs, but dang it.. I was there in the beginning! And ya know what... considering some of the programming for kids now... I'm glad i had Spin and Marty! Actually, something happened after we met. I got this "brain storm" (that's back when i had a brain) to write to Harry Carey Jr. (who played Bill Burnett, the head of the camp) and send him a copy of the photo I had taken of Tim and David. I didn't think too long when I searched to find out how I could write to him and found an address. I wrote him a letter and sent the photo. I think I told him how I loved Spin and Marty and thought he might enjoy seeing "the boys" as they look now. I also told him about the autograph show where I got to meet them. Anyway.. not too long later I got a note back from Mr. Carey thanking me for the photo and saying he was going to try to come to the show!! OOOOkay.. now I had to write to David or Tim and let "them" know in hopes they would do the show again. Which i did. Gosh, that made me wish I was a kid again with a crush on "Marty"! 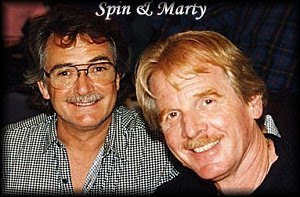 Anyway, I thought I'd finish up the "saga" of Spin and Marty for ya.. and for me.. I still get a smirk on my face when I think of it all. It's one of those memories you just never want to forget.. and I doubt I will. 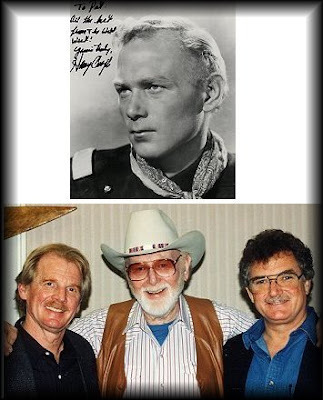 Here's a picture of Harry looking much like he did in the Spin and Marty days.. and a Photo of David, Harry & Tim at their "reunion". Yesterday I received an email from a comment made in my Archives.. it was dated back in January of 2006. Needless to say I was surprised! I don't think many people click on archives, in my case I did write more memories back then. 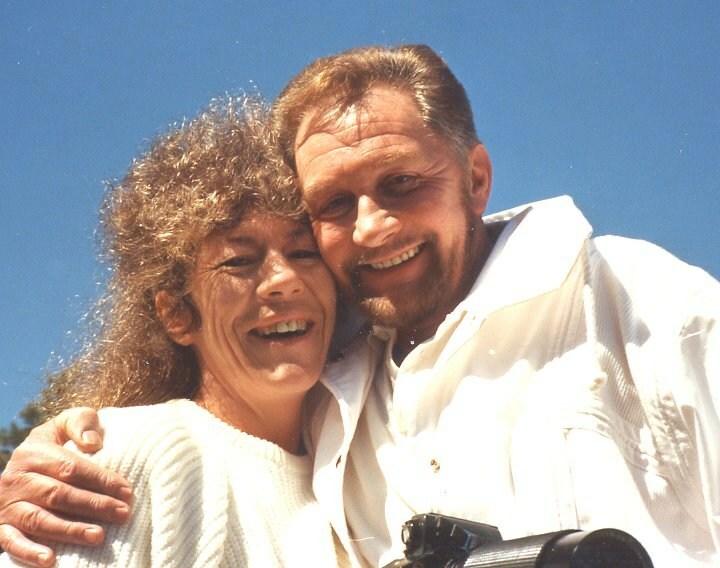 On the post I talked about Roy Dotrice, who is an actor I met back in 1989. His most popular role was from Televisions show of Beauty and the Beast, he played the character called Father. 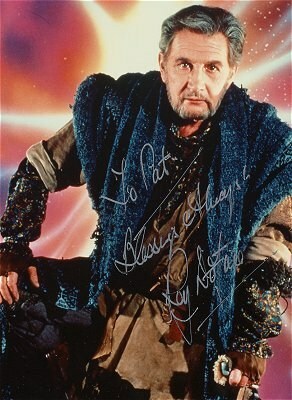 Born in May of 1923, Roy is now 85 yrs young and still going strong! Currently (or soon) he will be doing a one man show in England. You can read about it by clicking the link in the comment by Anonymous. On IMDb I found out Roy has a part in the upcoming Hellboy II as King Balor. This, to me was WONDERFUL news, as it reunites him with Ron Perlman who plays Hellboy, and was the Beast of Beauty and the Beast!! Life is sometimes strange.. having met Roy so many years ago, we kept contact for a few years, then life interrupted and I lost contact with him. Years later I did see him at a convention and low and behold, Roy remembered me and even asked why I hadn't written in so long! Life interrupted again. And I lost contact. A number of years ago I, for whatever reasons, wrote a story. I know you've heard me mention it, Kesterwood. In my story there's a man named Abbercorn. If you've ever talked to someone who has written a story (even like me, when written for no reason) you will hear them say that they can hear the voices of their characters in their head when they have them speaking. In that respect, I was no different, I too heard their voices.. and the voice of Abbercorn I knew immediately was that of Roy Dotrice. So for two years, as I wrote I heard Roy in my mind. Two years ago I wrote to him, not knowing where he was, I mailed it to his Hollywood address, and don't know if it ever reached him. I do know that this man (actor) has lingered with me since I first saw him on Beauty and the Beast, and I doubt he will ever leave me for very long. Hearing he was still working so much made me cheerful, but it was short lived when I read of him loosing Kay. This year would have been their 60th wedding anniversary! Now that's something you don't hear of often! He's such a nice man, and a really super actor! If you've never seen him you should click on any of the links below and watch any of the short videos of Roy!!! 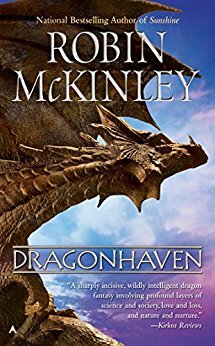 Although this book is set just prior to Dragonflight, It is best read after the first Trilogy. This book tells of Masterharper Robinton's details the life, right from his birth. It traces his loves, and his heartbreaks. The book lets you follow him through a childhood filled with rejection and neglect by his Mastercomposer father, Peitron, the overwhelming love of his Mastersinger mother, Merelan ,the loss of his wife, and the death of his best friend, while on his way to his becoming the Masterharper of Pern. This book, as her other books is done extremely well. It doesn't take huge jumps through his life, but rather small ones, so you don't miss anything about how and why he turns into the beloved Masterharper. It begins with his birth and ends where Dragonflight begins! You get to learn more about the holds and of course, HarperHall. 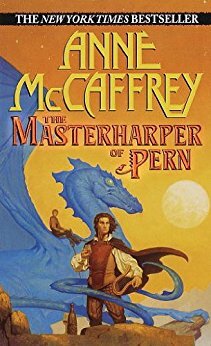 The Pern series of books will forever be my all time favorite books! There are a few other series I feel as strongly about, but... this group inches them out as the best! Yes, there are yet more Pern books, but for now I think I will cease my rereads and move on to something new... before my second round of rereads, heh! It seems that Cath found a book challenge that (for me) is a real no brainer! It's called "Here be Dragons"....I read more books with Dragons in them than anything else! The Challenge is being held at Stray Talk. You can click on the link to see if you too would like to join this Challenge. It's to read 3-5 books from January- June with dragons in them. Yeah, yeah.. anyone who reads my blog knows I am reading those books! I told you, for me it was a no-brainer!! It's kinda hard to resist a no-brainer, heh. For the record, I will say it's been many years since I re-read the Pern series, so I am already enjoying the first one as much as ever! Dragonflight is even keeping me up past my bedtime reading! Sheesh! You'd think I'd never read it before! I wish I could remember when I first read these books. I still have the old paperback I bought.. it's yellow and getting quite brittle (so I replaced it with a new tpb) . I looked on the inside to see if I could tell what year the old books was. First copywrite was 1968.. 16th printing was 1980..so I can't really tell what year I bought it. (my guess would be about 1970. And the first person to say "I wasn't born yet" I will search down and haunt you!) My first "replacement" was a Doubleday hardback that contained the first 3 novels. This is the 3rd or 4th time I've read the books. Listen to this! : back then (wa-a-a-a-ay back) the paperback price was only $2.25 !! Oh man! Don't we wish mass paperbacks were that price now?!!! I love Pern. I love the dragons. And I love stories of Pern. I have to admit that what came across with this book is that it's a long, short story. 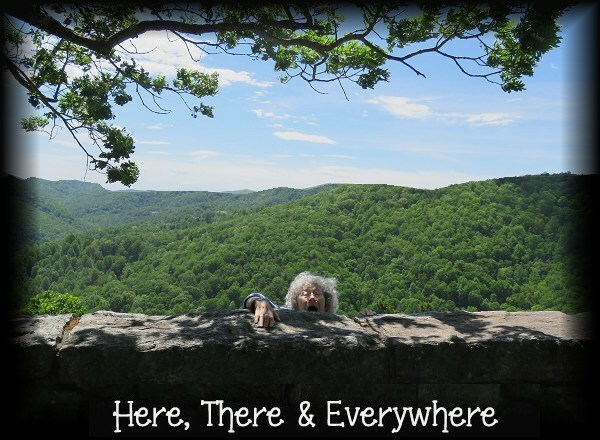 The story wrapped around one incident that occurs in Pern. It begins at Harper Hall with a young man named Kindan who is hoping to become a Harper and maybe even be assigned to Benden Weyr. It's a story of friendships, accepting female Harpers and of loss when an overwhelming plague hits Pern. It's a story of young love and youth cut short and of becoming all that you can be. Like I said, it's a good story.. but to me it shouldn't have been a hardback book. Much of it did not seem like the writing of Anne McCaffrey, or even Todd McCaffrey (from the other books of his I've read). This may sound odd, but it's how I felt when I say, parts of the book sounded like something a non professional writer could do. That's not to say it wasn't good.. but it is to say, I have come to expect more from the McCaffrey authors. So to rectify this I am going to begin my first re-read of the year by reading the first Pern novels!